From a stewardship perspective it is recommended that antibiotic guidelines are adjusted to the local setting, accounting for the local epidemiology of pathogens. In many settings the prevalence of Gram-negative pathogens with resistance to empiric sepsis therapy is increasing. How and when to escalate standard sepsis therapy to a reserve antimicrobial agent, is a recurrent dilemma. The study objective was to develop decision strategies for empiric sepsis therapy based on local microbiological and clinical data, and estimate the number needed to treat with a carbapenem to avoid mismatch of empiric therapy in one patient (NNTC). We performed a nested case control study in patients (> 18 years) with Gram-negative bacteremia in 2013–2016. Cases were defined as patients with Gram-negative bacteremia with in vitro resistance to the combination 2nd generation cephalosporin AND aminoglycoside (C-2GC + AG). Control patients had Gram-negative bacteremia with in vitro susceptibility to cefuroxime AND/OR gentamicin, 1:2 ratio. Univariate and multivariable analysis was performed for demographic and clinical predictors of resistance. The adequacy rates of empiric therapy and the NNTC were estimated for different strategies. The cohort consisted of 486 episodes of Gram-negative bacteremia in 450 patients. Median age was 66 years (IQR 56–74). In vitro resistance to C-2GC + AG was present in 44 patients (8.8%). Independent predictors for resistance to empiric sepsis therapy were hematologic malignancy (adjusted OR 4.09, 95%CI 1.43–11.62, p < 0.01), previously cultured drug resistant pathogen (adjusted OR 3.72. 95%CI 1.72–8.03, p < 0.01) and antibiotic therapy during the preceding 2 months (adjusted OR 12.5 4.08–38.48, p < 0.01). With risk-based strategies, an adequacy rate of empiric therapy of 95.2–99.3% could be achieved. Compared to treating all patients with a carbapenem, the NNTC could be reduced by 82.8% (95%CI 78.5–87.5%) using the targeted approaches. A risk-based approach in empiric sepsis therapy has the potential to better target the use of reserve antimicrobial agents aimed at multi-resistant Gram-negative pathogens. A structured evaluation of the expected antimicrobial consumption and antibiotic adequacy rates is essential to be able to weigh the costs and benefits of potential antibiotic strategies and select the most appropriate approach. Current guidelines on antibiotic stewardship recommend to adapt empiric therapy to local microbiological data . However, specific recommendations on when and how to change the empiric treatment guidelines in response to increasing resistance rates are lacking. The empiric strategy may need to be broadened to guarantee coverage of the most common pathogens. The downside of this action is an increase in selective pressure, driving further emergence of resistance . Therefore, whether or not to escalate empiric treatment guidelines in response to new resistance data is a recurrent dilemma in antibiotic policy committees all over the world. Strategies that break the vicious circle of increasing resistance and increasing antibiotic consumption are needed [3–5]. The use of a risk-based discrimination in empiric therapy has this potential. If patients with a high probability of infection with a resistant pathogen can be identified upfront, empiric therapy can be escalated selectively [6, 7]. This approach combines the two major aims of antibiotic stewardship: promoting effective antimicrobial therapy in all patients, while limiting antibiotic usage where possible . Both aims are especially relevant in sepsis guidelines . The importance of prompt initiation of effective empiric therapy in this patient category is well recognized [10–14], and the antibiotic consumption associated with empiric treatment for (presumed) sepsis is substantial [15, 16]. In the Netherlands and other countries with low to moderate resistance rates, the standard treatment for sepsis of unknown origin often is a second or third generation cephalosporin (2GC or 3GC) combined with an aminoglycoside (AG) . The prevalence of Gram-negative pathogens that are resistant to this empiric treatment combination, due to production of extended spectrum β-lactamases (ESBL) and other mechanisms, is increasing . This development warrants regular re-evaluation of empiric sepsis therapy recommendations and consideration of escalation to a carbapenem. The study objective was to explore a practical method to design institutional strategies for empiric therapy based on local microbiological and clinical data, and to estimate the potential treatment adequacy rates and reserve antimicrobial consumption for each of these strategies. Define A) the clinical syndrome for which empiric treatment is re-evaluated, B) the patient population and C) the current empiric treatment guideline. The clinical syndrome is sepsis. The target patient population is adult patients in an academic medical center. The current empiric treatment for sepsis is C-2GC-AG. Determine the local prevalence of resistance to the current empiric treatment (syndrome and population specific). Of all patients with suspected sepsis, 6.7% are diagnosed with Gram-negative bacteremia. * Gram-negative resistance for C-2GC-AG in blood culture isolates is 8.8%. In the study center. Methicillin resistant Staphylococcus aureus (MRSA) and penicillin resistant pneumococcal species are very rare in the Netherlands. Identify available predictors for resistance to the current empiric treatment. Independent risk factors of resistance to empiric sepsis therapy in the study population are prior antimicrobial use and prior isolates with a DRP. Identify potential targeted treatment strategies. Option A: A carbapenem in patients with a DRP cultured the previous 6 months and C-2GC-AG in other patients. 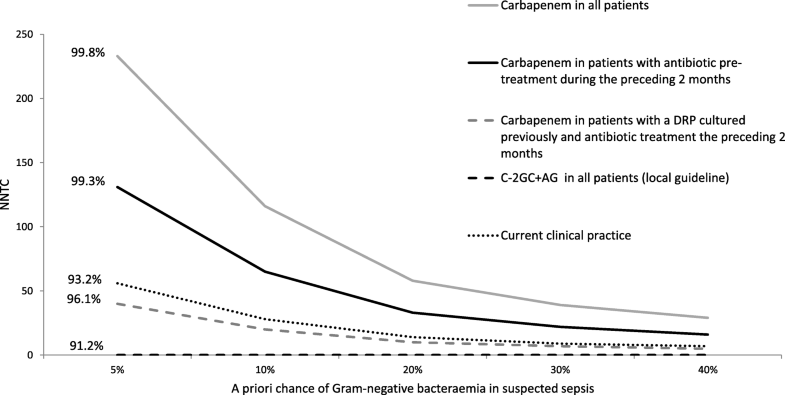 Option B: a carbapenem in all patients with sepsis. Estimate the proportion of patients that would be adequately treated if empiric sepsis therapy was changed. Option A: 95.2% of Gram-negative bloodstream infections would be treated adequately. Option B: 99.8% of Gram-negative bloodstream infections would be treated adequately. Identify the number needed to treat (NNTC). Option A: NNTC is 42 patients. Option B: NNTC is 173 patients. Balance the cost and benefits of phase 5 and 6 to select the most appropriate strategy. A moral deliberation with stakeholders was performed to decide on the most appropriate antibiotic therapy for sepsis in the institution. Option A was selected. Evaluate the costs and benefits of the selected approach. After implementation of strategy A, adequacy rates, outcome, side-effects of antimicrobials and antimicrobial consumption were evaluated. The study period was defined as from January 2013 to December 2016. The Leiden University Medical Center (LUMC) is a tertiary care hospital in the Netherlands. Standard empiric sepsis therapy in the institution consisted of a second generation cephalosporin, cefuroxime, combined with gentamicin (C-2GC + AG). In 2013–2014, all patients > 18 years of age, with monomicrobial Gram-negative bacteremia were included (cohort 2013–2014). Both community acquired and nosocomial episodes were eligible for inclusion. Patients were identified through search of the microbiology laboratory database. Gram-negative bacteremia was defined as one or more positive blood cultures with a Gram-negative micro-organism. Cases were defined as adult patients with bacteremia with Gram-negative micro-organisms with reduced susceptibility to C-2GC + AG. Reduced susceptibility was defined as intermediate sensitivity (I) or resistance (R) according to the European Committee on Antimicrobial Susceptibility Testing (EUCAST) criteria to 2GC and AG. Control patients were defined as patients with Gram-negative bacteremia with a micro-organism susceptible to 2GC, AG or both. Two control patients per case patient were randomly selected from the cohort. Using the patient identification code, every third patient meeting the criteria for control was selected. The inclusion period for the case selection was prolonged with two additional years (2013–2016) compared to the cohort (2013–2014), because of the relatively low incidence of combined 2GC and AG resistance. It was assumed that the characteristics of the control and case populations were not variable over the period of study. Clinical data were collected from the electronic medical records and included demographics, co-morbidities, clinical characteristics at the time of presentation and known risk factors of antimicrobial resistance [6, 8, 20–23] such as a history of recurrent urinary tract infections (UTI’s), previous hospital stays and previous antibiotic treatment. Previous antibiotic treatment was defined as administration of one or more antibiotic doses during the previous 2 months. Current antibiotic use was defined as at least one administration of antibiotics during the 24 h preceding the collection of blood specimens. For in-hospital and outpatient clinic prescriptions these data were obtained from the institutional electronic prescription system. For other prescriptions, the documented patient history, referral letters and correspondence with other health care providers were searched. Prior known colonization or infection with a drug resistant pathogen (prior-DRP) was defined as the isolation of one of the following pathogens from any body site, including rectal swabs: vancomycin resistant enterococci, methicillin resistant Staphylococcus aureus, Enterobacteriaceae with in vitro resistance to AG, second and/or third generation cephalosporins and/or quinolones, Pseudomonas aeruginosa with resistance to third generation cephalosporins, AG or quinolones. In clinical practice, physicians may defer from standard sepsis therapy for a variety of reasons, including a high suspicion of antimicrobial resistance. To assess current practice, the antibiotics that constituted the initial empiric therapy were extracted from the patient records. Empiric therapy was considered adequate if at least one of the antibiotics matched the in vitro susceptibility of the isolated pathogen. Multiple episodes of bacteremia per patient were allowed if the antimicrobial therapy for the previous episode had been completed and clinical and microbiological cure had been achieved. Microbiological data were retrieved from the database of the Microbiology department and included the isolated micro-organism and susceptibility patterns of the current and previous episodes. Blood cultures were incubated using the BACTEC™ blood culture system (Becton Dickinson Benelux, Erembodegem, Belgium). Identification of isolates was performed using matrix-assisted laser desorption/ionisation-time of flight spectrometry (MALDI-TOF) using the Microflex system (Bruker, Bremen, Germany). Antimicrobial susceptibility testing was performed with the VITEK2 system and E-tests (BioMérieux, Brussels, Belgium). Extended-spectrum beta-lactamase (ESBL) production was determined by the use of the combination disc diffusion test . Minimum inhibitory concentration (MIC) breakpoints for resistance and intermediate sensitivity were based on EUCAST criteria . Imputation for missing data was not applied. Categorical variables were reported as counts and percentages and continuous variables as medians with interquartile ranges (IQR). Univariate analysis of clinical predictors of reduced susceptibility to empiric therapy was performed using the Fisher’s exact test and reported as odds ratios (OR) with 95% confidence interval (95% CI). All variables that showed a trend towards an association (P < 0.2) were included in the logistic regression analysis. Potential targeted empiric treatment strategies were designed based on the strongest independent predictors of resistance to C-2GC + AG. The proportion of patients with bacteremia that would receive adequate treatment with the strategy (adequacy rate) and the number of patients needed to treat with a carbapenem to avoid mismatch of therapy in one patient (NNTC) were estimated using the formula described in Supplement A. The data for these estimations were derived from the study cohort: The frequency of the strategies risk factor(s) (cohort 2013/2014), the frequency of reduced susceptibility to gentamicin/cefuroxime and to carbapenems (cohort 2013/2014), and the sensitivity of the specific risk-based strategy for the presence of resistance to cefuroxime/gentamicin (cases 2013–2016). The NNTCs of the risk-based strategies were compared to the theoretical scenario of uniform application of the local sepsis guideline and the actual clinical practice data. The NNTC was assessed for different theoretical probabilities of Gram-negative bacteremia in patients treated empirically for presumed sepsis. All statistical analyses were performed with IBM SPSS Statistics, version 23. The cohort (2013–2014) consisted of 486 episodes of Gram-negative aerobic bacteremia in 450 patients. The final database had < 2% missing data. Median age was 66 years (IQR 56–73), in 263 (54.1%) episodes, the patient was male. 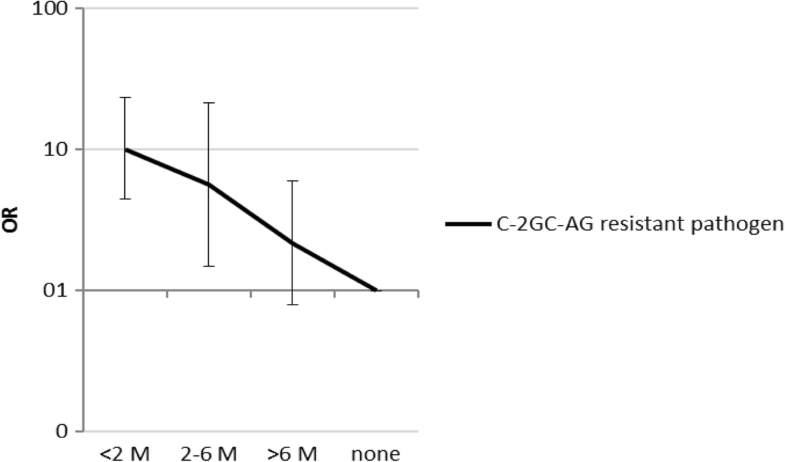 In this cohort in vitro reduced susceptibility to 2GC monotherapy was present in 176 patients (36.2%), reduced susceptibility to AG in 84 patients (12.6%) and to the combination C-2GC + AG in 43 patients (8.8%). In 95/486 (19.5%) a drug resistant pathogen (DRP) was cultured previously, in 54/95 (56.8%) the prior-DRP was isolated during the preceding 6 months. A total of 144/486 (29.6%) patients were already on antibiotic therapy when they were evaluated for suspected sepsis and 257/486 patients (52.9%) had been treated with antibiotics in the preceding 2 months. Empiric therapy contained a carbapenem in 27/486 (5.6%) of patients. Of the 43/486 (8.8%) patients with in vitro resistance to C-2GC + AG, 12/43 (27.9%) received adequate empiric treatment. The 30-day mortality rate for the cohort was 59/486 (12.1%). Resistance to carbapenems was 1/486 (0.2%). After applying the case criterion for Gram-negative bacteremia with in vitro reduced susceptibility to cefuroxime and gentamicin, 71 patients (2013–2016) were identified as cases and 142 controls were randomly selected from the remaining patients in the cohort. The demographic and clinical characteristics of cases and controls are shown in Table 2. Supplement B depicts the pathogen distribution. The causative pathogen was ESBL producing in 64.8% (46/71) and 6.3% (9/142) in cases and controls respectively (p < 0.001). Data are presented as No. (%). P values are calculated by Fisher exact test, p-value for ‘source of infection’ was calculated by chi-square test. Abbreviations: OR = odds ratio, EMV-score: eye-motor-verbal score. ICU/MCU = intensive care unit / medium care unit. IQR = interquartile range. A Hypotension = systolic blood pressure < 90 mmHg or requirement for intravenous vasopressor agents. B ‘Current antibiotic use’ = at least one administration of antibiotics during the 24 h preceding the collection of blood specimens. c ‘Prior-DRP’ = one of the following drug resistant pathogens isolated from any body site: Vancomycin resistant enterococci, multi resistant Staphylococcus aureus, Enterobacteriaceae with in vitro resistance to aminoglycosides, second and/or third generation cephalosporin’s (including ESBL positive Enterobacteriaceae) and/or quinolones, Pseudomonas aeruginosa with resistance to third generation cephalosporins, aminoglycosides or quinolones. The result of the univariate analyses are shown in Table 2. Patients with hematologic malignancy or neutropenia were at increased risk of a pathogen with reduced susceptibility to C-2GC + AG. Pre-treatment with antibiotics in the 2 months prior to presentation and antibiotic treatment at the day of presentation were associated with presence of reduced susceptibility to C-2GC + AG. In addition, previous admission on general wards, ICU wards and length of hospital stay were strong predictors of reduced susceptibility to standard empiric therapy. The strongest crude predictor was prior isolation of a resistant micro-organism from any site, including rectal swabs. Figure 1 depicts the odds ratio for infection with a pathogen with reduced susceptibility to C-2GC + AG, depending on the time elapsed between the DRP cultures and the current presentation with infection. In the multivariable analysis a previous culture with a DRP (adjusted OR 3.72 95%CI 1.72–8.03, p < 0.01), antibiotic use during the preceding two months (adjusted OR 12.5, 95%CI 4.08–38.48, p < 0.01), and a hematologic malignancy (adjusted OR 4.09, 95%CI 1.43–11.62, p < 0.01) were independently associated with reduced susceptibility (Supplement C). The relevant risk factors for resistance to empiric therapy derived from the multivariable analysis were used to design five different risk-based empiric sepsis treatment strategies. The calculated effect of these individual strategies on the proportion of patients with Gram-negative sepsis that would be treated adequately and the corresponding NNTC are shown in Table 3, and for a selection of strategies in Fig. 2. The NNTC is to a large extent dependent on the number of patients that are empirically treated for sepsis. This number is much larger than the number of patients that are eventually diagnosed with Gram-negative bacteremia. To account for these differences in prevalence of Gram-negative bacteremia amongst patients that are empirically treated for presumed sepsis, the NNTC was assessed for different probabilities of Gram-negative bacteremia. (Fig. 2, Table 3). 3. Only a carbapenem in patients with antibiotic pre-treatment on day of culture. In the scenario of ‘standard empiric carbapenem therapy in all patients’, the adequacy rate of empiric therapy was 99.8%. The corresponding NNTC was 29 to 233, depending on the probability (i.e. high: 40% to low: 5%) of Gram-negative bacteremia. Alternatively, risk-based strategies resulted in an estimated adequacy rate of 95.2–99.3%. Compared to treating all patients with a carbapenem empirically, the NNTC in the targeted approaches was a factor 2.3 to 4.6 lower, depending on the selected approach. The NNTC was lowest if a carbapenem would be reserved for patients in whom a DRP was cultured previously and antibiotic treatment had been administered in the preceding 2 months. The estimated reduction of carbapenem use was 82.8% (95%CI 78.5–87.5%). This strategy had a treatment adequacy rate of 96.1% of patients with Gram-negative bacteremia. This is an absolute increase in adequacy rate of 4.9% compared to the local guideline and an absolute increase of 3.0% compared to clinical practice (Fig. 2, Table 3). Using real-life clinical and microbiological data, we propose a method to develop risk-based empiric antibiotic policies and to estimate the potential costs and benefits of policy changes (Table 1). Although there are multiple previous prediction rules for infection with resistant pathogens, the applicability of these rules to the selection of institutional empiric antimicrobial treatment is limited. The majority of prediction score studies focused on a specific pathogen or a specific mechanism of resistance, for example ESBL [6, 20, 25–27]. For clinical practice, it is more relevant to predict susceptibility to an empiric regimen in a predefined clinical syndrome, instead of predicting the presence of a specific mechanism of resistance. Secondly, the consequences of implementation of the prediction scores on adequacy rate and/or NNTC are frequently lacking [6, 7]. Thirdly, the susceptibility of pathogens and the risk factors for resistance may vary substantially amongst institutions, making it is necessary to base empiric treatment recommendations on local epidemiology. Our 7-step method can be used to develop institutional empiric policy for a variety of clinical syndromes, and focusses on applicability of the results in daily clinical practice. In response to increasing resistance rates, we applied the method to improve empiric coverage of causative Gram-negative micro-organisms in sepsis, while maintaining a responsible antimicrobial policy with regard to antibiotic consumption. Our data show that in current practice, clinicians already incorporate an assessment of the risk of a resistant pathogen in decision-making, with a relatively low NNTC. The treatment adequacy rate however, can be further increased using targeted strategies, without increasing inappropriate reserve antimicrobial consumption. The NNTC was stratified according to the theoretical probability of Gram-negative bacteremia. Previous literature on positivity rates in consecutive blood cultures, shows probabilities of Gram-negative bacteremia below 5% [28, 29]. However, the positivity rate varies substantially depending on the patient population, to up to 41% in septic shock [28–34]. As a result, the NNTC in the critically ill is considerably lower than in a low acuity population [16, 29]. The strategies were based on bacteremia. Including non-bacteremic infections, would further decrease the NNTC. We focused on bacteremia, as the importance of adequate empiric treatment is higher in bacteremic, compared to non-bacteremic episodes. A limitation of the study is the retrospective data collection. There is potential underreporting of antibiotic pre-treatment. However, this effect is limited, given the use of electronic prescription systems. In addition, potentially important predictive factors, such as travel history, may have been missed, because of limited availability of specific information in the medical charts. Incorporating more determinants, could improve the strategies and further reduce NNTC. A second limitation is that, in our analysis of the NNTC, we assumed that the identified predictors of antimicrobial resistance are independent of the a priori risk of Gram-negative bacteremia. On theoretical grounds, we do not expect previous antibiotic use and colonization with DRP’s to have an important etiologic effect on the a priori risk of Gram-negative bacteremia itself. Thirdly, the inclusion period for cases was prolonged compared to the initial cohort, because of the low incidence of C-2GC + AG resistance. Although the epidemiology of antimicrobial resistance is subject to change over time, it is unlikely that the prolonged inclusion period would affect risk factors associated with C-2GC + AG resistance (step 3). The reported results on Gram-negative bacteremia are institution specific. Differences in antimicrobial susceptibility rates, patient population and treatment guidelines between institutions may all affect treatment adequacy rates and the NNTC. However, the method that was used to determine a center-specific NNTC is applicable in every setting. From a scientific perspective, prospective validation within the institution is preferable, before implementation is considered. However, prospective validation would hamper a timely response to the latest resistance data, resulting in a difficult process of catch-up because of changing epidemiology. Therefore, cyclic evaluation and optimization within the institution after implementation is - from a practical point of view - preferable to further improve targeted antibiotic strategies. In step 7, the benefits of adequate therapy and the costs of the associated antimicrobial consumption need to be weighed to select the most appropriate strategy. The rate of inadequate empiric therapy that clinicians are willing to accept, varies according to the severity of the clinical syndrome. For sepsis, and especially septic shock, the optimal balance between antibiotic adequacy rate and consumption of reserve antimicrobial agents is incomparable to the setting of more benign infections, for example cystitis. How to balance these aspects is highly complex. This also involves ethics, as decisions do not merely affect patients today, but impacts future generations as well . The number needed to treat with reserve antimicrobial agents contributes to this ethical discussion. This study demonstrates the feasibility of generating these numbers for the local situation. The present study exemplifies a method to develop risk-based empiric antibiotic policies and estimate the effects on treatment adequacy and antimicrobial consumption. The approach has the potential to target the use of reserve antimicrobial agents and can be applied in different clinical settings to optimize empiric antibiotic therapy. Because of the non-interventional, retrospective design of the study, the Dutch Medical Research Involving Human Subjects Act did not apply . The National Institute for Health and Care Excellence. Antimicrobial stewardship: systems and processes for effective antimicrobial medicine use (NICE guideline 15). 2015. Available at: https://www.nice.org.uk/guidance/ng15. Stichting Werkgroep Antibioticabeleid (SWAB). SWAB guidelines for Antibacterial therapy of adult patients with Sepsis. 2010. Available at: https://www.swab.nl/swab/cms3.nsf/uploads/F2F67409D244EF43C1257B3C00322D14/$FILE/RevisedSepsis%20richtlijn_vertaling_finaal2.pdf. National Institute for Public Health and the Environment, Stichting Werkgroep Antibioticabeleid (SWAB). NethMap 2017: consumption of antimicrobial agents and antimicrobial resistance among medically important bacteria in the Netherlands. 2017. Available at: https://www.rivm.nl/bibliotheek/rapporten/2017-0056.pdf.